Review: Eddie Redmayne and Felicity Jones shine in James Marsh's lovely "The Theory of Everything"
It seems appropriate that for a film about Stephen Hawking, a man who has transcended a myriad of human limitations both physical and mental, James Marsh’s The Theory of Everything reaches past the boundaries of the conventional historical drama to deliver the rare biopic that is smart, sensitive, and aesthetically profound. With its beautiful musical score and rich, gorgeous cinematography, along with a relaxed and lyrical pace that treads gracefully across decades, the film is far more cinematically engaging than these pictures usually are, while its perceptively pared-down approach to Hawking’s story proves uncommonly touching and insightful. Structured not as a typical subject-centered biopic, but as a dual-narrative shared in equally by Stephen and his first wife Jane, The Theory of Everything succeeds most powerfully in providing multiple perspectives on Hawking’s extraordinary life. Thanks in no small part to the superior work done by Eddie Redmayne and Felicity Jones in their respective parts, the film passionately illustrates the ‘mundane’ details of life biographical films usually avoid or trivialize: the complications of loving another person, the divergent needs and desires found within a human partnership, and the little things that compound over the years to change people and alter the foundations of a relationship. It would be easy to make a film about Stephen Hawking focusing on his physical challenges to the exclusion of all else, and while The Theory of Everything absolutely excels at relating the most harrowing and inspiring trials of Hawking’s battle with ALS – there is one moment in particular, late in the film, that is quietly heart-wrenching and beautiful in equal measure, and may be the high-point of the entire picture – it does so within a dynamic and relatable human context. Neither Hawking’s genius nor his disability stops him from being a man, and the film resonates strongly as a deceptively simple examination of a romantic partnership over time. This is a film of literal and thematic unions, between Jane and Stephen, faith and science, disability and normalcy, and at the film’s best, these myriad halves work together to say something rather profound about the wonder and ecstasy of being human. It strikes me as the sort of message Hawking himself would approve of. Intensely character-focused at all times, Redmayne and Jones are the film’s central focus and attraction, and the work done by both of them is extraordinary. Each part is demanding, for while Redmayne may be the one tasked with imitating one of the world’s most physically distinct figures, Jones has to assert a far less famous personality against him, building an equally vibrant character with far less to go on. Both pull it off with aplomb, whether sharing scenes together or acting apart. Redmayne throws himself into the physicality of his role with admirable abandon, sinking so completely into the physical shape and posture of Stephen Hawking that it is easy to get lost in the illusion of the film, and forget one is watching an actor inhabit another man’s body. But a great imitation alone does not equal a great performance, and Redmayne shines brightest in conveying volumes about Hawking’s interior life, mind, and most importantly, personality through little details nestled amongst the part’s heavily restrictive physicality. I don’t know if I have ever seen an actor convey so much with a smile, or with the raise of an eyebrow. 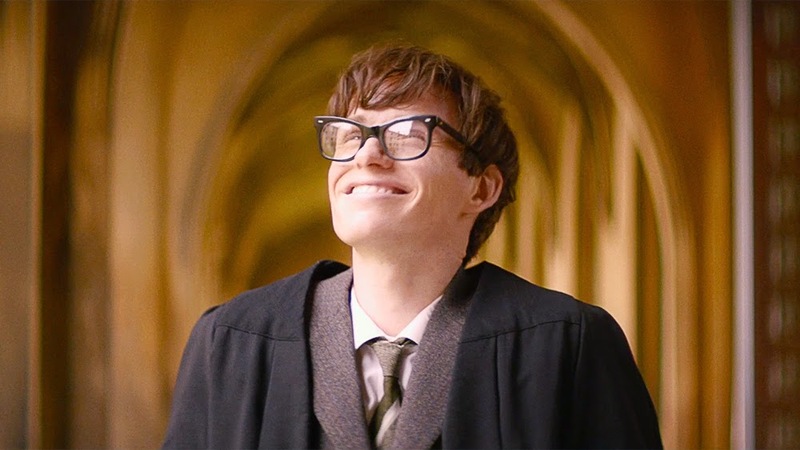 There is something magical about Redmayne’s work, his every moment of screentime displaying such a clear, infectious passion for Hawking’s character, and all without ever sacrificing the flawed, human traits that make the man interesting – and, through all the intellect and incapacity, identifiable. The prospect of a Hawking biopic is an inevitably tricky one, as cinema’s track record with depictions of disability is hardly glowing, but this is a smart and sensitive portrayal, always acknowledging the realities of Hawking’s situation without prioritizing those details above his humanity. Jones impresses me every bit as much, if not more so in some ways, and just as in her breakthrough role in 2011’s Like Crazy, I feel there are few actors working today who can project interiorized conflict, elation, or strength as forcefully as she does. Jones is a performer of small gestures and restrained, even vocals, yet she simply radiates dynamism, and for a character whose arc involves putting so much of her life on hold for her partner, Jones is beyond a perfect fit. One of the most interesting through-lines in the film is the debate between science and religion encompassed in the Hawkins’ marriage – Jane is a devout Christian, Stephen an atheist (or, at least, a skeptic) – and while there are moments where the film approaches the subject a little too obviously or cautiously, so much of the film’s overall richness comes from giving voice to these seemingly opposing points of view. In crafting such an engaging characterization of Jane Hawking, and casting an actress as talented as Jones who can go toe-to-toe with Redmayne and make her character and perspective feel as equally passionate and vibrant as Stephen’s, the film makes this conflict feel alive and complex in ways I would not have anticipated beforehand. As someone who is pretty staunchly set on Stephen’s side on these matters, I could never have expected to walk out of the theater feeling so fulfilled by the reminder that theological views can also form a valuable part of the human condition, and that while science may be the way we advance the progression of mankind, human beings can access the wonder of the world through a variety of contexts. Stephen sees ecstasy in the theories he creates about the origins of the universe, Jane finds beauty and solace through the church, and each is enlightened by their ideological exchange with the other. By giving each of these characters equal weight and room in the story, and by providing this showcase to two performers of such incredible talent, The Theory of Everything does indeed offer the sort of unified, wondrous perception its title suggests. The music and visuals too are essential in creating this effect; in fact, even if the writing and performances failed to impress, I might be compelled to recommend the film on aesthetic merits alone. Cinematographer Benoît Delhomme has crafted a consistently marvelous image, a rich and deeply observant series of compositions cast in warm, golden hues. The photography is intensely sensory throughout, putting the viewer deeply in tune with all the details of the film’s world while watching, as if there is a heightened sense of splendor and ecstasy to all parts of existence. This is, of course, one of the implicit messages of Hawking’s life and work – that no matter how the world may appear to the naked eye, or how we are physically capable of interacting with it, there is so much more to life than our bodies can see or sense. The brilliance of a man like Hawking lies in his ability to see past those basic boundaries and imagine something greater, something larger and more significant in ourselves, and to revel in it long enough to draw some perception-altering conclusions on the nature of the universe – an idea this gorgeous cinematography quietly reinforces at every turn (and which belongs equally to Jane, as part of the film’s overall push-and-pull between scientific and theological experiences of transcendence). Jóhann Jóhannsson’s music is a perfect complement; soft and lovely and lilting, penetratingly expressive and highly sensory in its own way, it neatly sidesteps empty sentimentality to become a profound part of the film’s emotional tapestry in its own right. The Theory of Everything is not quite what I expected, which in the case of a problematic genre like the biopic, is always a good thing. Even as there are elements of Hawking’s story I would have liked to see more of – his actual scientific breakthroughs, while by no means glossed over, are generally left on the periphery, an interesting choice for the story of a man who has done so much to bring complex cosmological theory to the masses – I understand and admire the balance struck here. The film implicitly argues that we can draw as much from Hawking’s personal life and relationships as we can his scientific advancements, and in a way, that profound human foundation only makes his greatest accomplishments seem even more palpable and, in turn, awe-inspiring. The Theory of Everything does not wholly rewrite the rules of biographical cinema, but it is sharp, empathetic, and touching in a way these sorts of films so rarely are, easily justifying its own existence and, if anything, leaving me wanting more by the time the end credits rolled. The individual achievements in acting, cinematography, music, production design, and more are all among the year’s best, and while it might not make my personal Top 10, this is one of the more passionately-made films I have seen all year, and that counts for an awful lot. 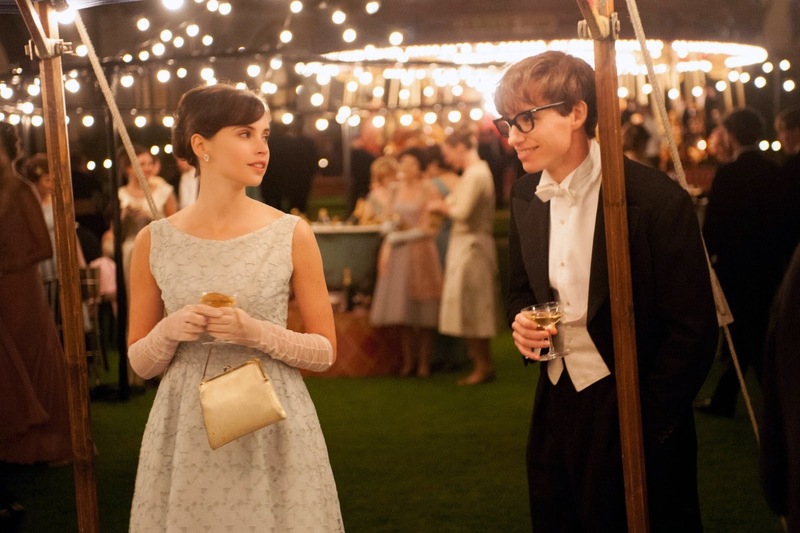 The Theory of Everything opens in Denver on Friday, November 14th at the Landmark Chez Artiste. Some people think that there isn't enough about Stephen's achievements in the film.Many excellent documentaries were made on this topic, we can learn everything about this from those. This film isn't a conventional biopic about Stephen Hawking, this is the story of his relationship with Jane from her point of view. I think the two person's part have to be equal, it not would be good if Stephen's work gets more focus. I agree with the filmmakers choice in this matter.